One last delicious dessert perfect for Easter or any party! 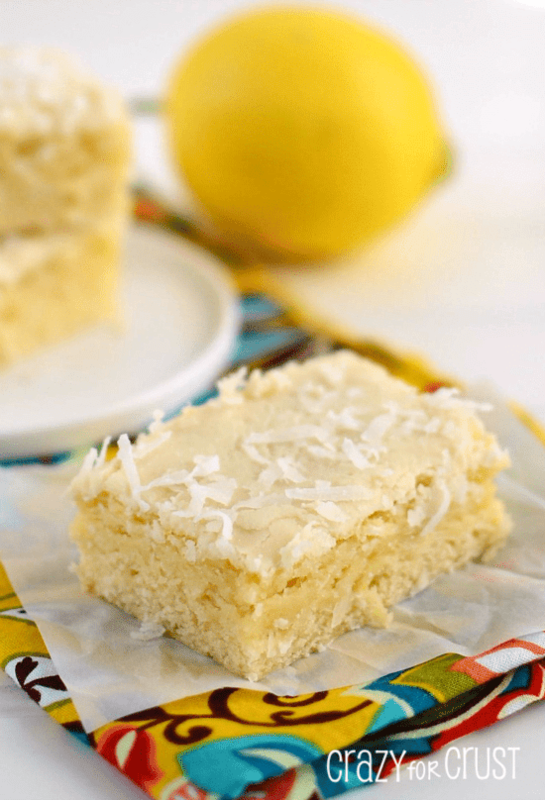 Lemon Coconut Blondies are thick and chewy like a blondie, but made with coconut, lemon, and white chocolate. 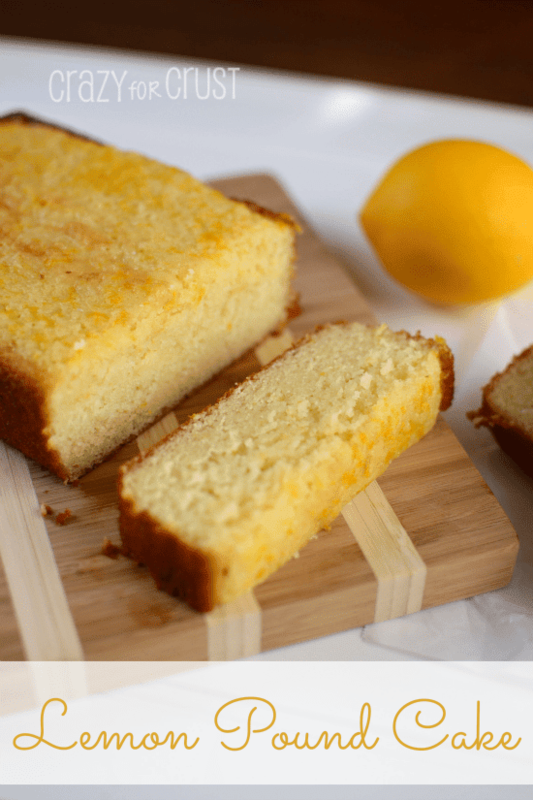 The perfect bite for your citrus fix! Never underestimate the power of social media. Sometimes I forget how many people are really watching – and this week I was reminded of that (in a good way). On Sunday, when I posted my Carrot Cake Roll and talked about being alone for a blissful few hours so I could get a weeks’ worth of work done, my site went down. Sure, it was only for about a half hour, just enough time for me to take a shower, which I needed to take a break and do anyway. But I was angry – angry because my site seems down more than it’s up. I’ve had no less than 10 “server issues” since I started with Bluehost back in September. Whenever I called tech support I got the “maintenance” spiel (yeah, at 9am on a Sunday morning? Riiiiiight.) There have been too many excuses to list here, really, so needless to say, the tech on the phone got an earful. During this saga, someone tweeted me because they couldn’t get to my site. In my anger, I wrote back something along the lines of “I hate…” which, yes, I know is totally childish but, come on. After months and months of this, I was fed up. My traffic doesn’t dictate that I should pay gazillions of dollars a month for a dedicated server – so why couldn’t they fix the problem? Or tell my WHY? I didn’t use an # or @ in any of my posts that day. I mentioned Bluehost by name, but never actually tweeted them. Ah, but you see – Big Brother is watching. By Monday, I had a scheduled server transfer to a Pro server (I guess that’s better than shared – I have my own IP address now, whatever that means). Of course, we won’t talk about how they didn’t actually switch me as scheduled. And the L1 tech on the phone I was screaming at at 6am on Tuesday was less than impressed with me. He thought I should be “grateful” that “they called me” and offered “the Pro service for FREE!” (Yes, I’m quoting). So, I’m saying a (albeit shaky) thank you to Bluehost. For the upgrade. And the nice tech named Mike. Mike, I’d like your personal phone number so I can just call you from now on, mmkay? Or, the power of lemon. Since my obsession with lemon began, I’ve been wanting to make a lemon brownie/blondie/bar thingy. I actually made these a few times. First, I used the Vanilla Bar recipe (the same one I used to make the Peanut Butter Brownies) to make a lemon version. So, I started over. Once I discovered the recipe for Toffee Blondies, which I then turned into Nutter Butter Butterscotch Blondies, I had the right measurements. So I took that recipe and turned it into these. Instead of brown sugar, I used white. And I added coconut and lemon juice and zest. They baked up dense and chewy, almost like a cake. But they’re a bar. Let’s call them a cakar. Or a barake. 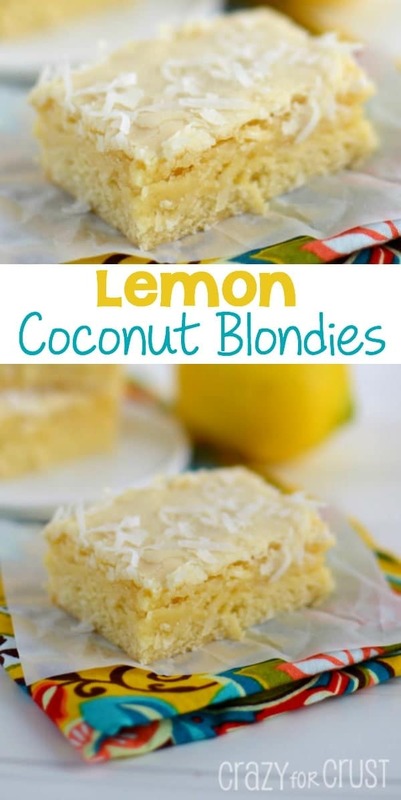 Or, maybe we should stick with Lemon Coconut Blondies. Because lemon and white chocolate should be married and have children, I frosted these with a white chocolate frosting. I melted white chocolate and butter together, and mixed in powdered sugar and cream. It seems like it’s funky and separated, but once it spreads on the bars, it’s totally fine. And since I topped them with coconut, any imperfections are totally covered. When in doubt, add more coconut. These would be the perfect complement to your holiday table. Or to any table, really. Or, maybe you can make them in the hopes that it will stop snowing where you live. Maybe the sunny lemon will bring the sun. Never underestimate the power of social media. 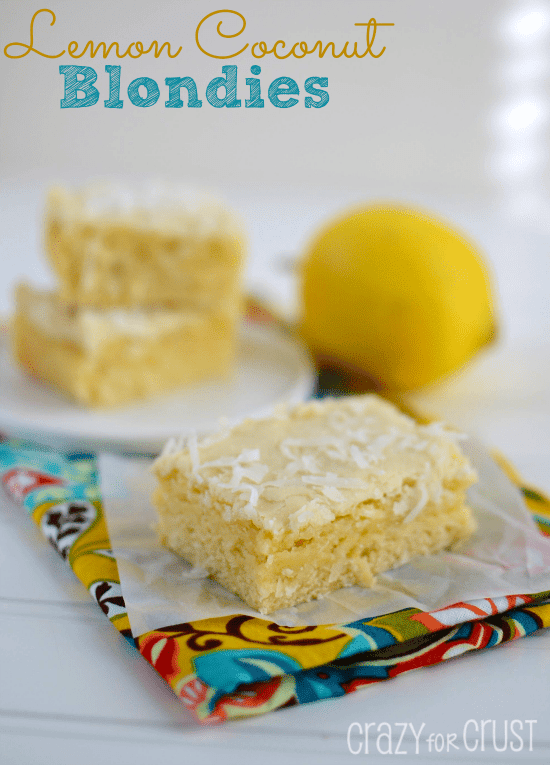 Or lemon bars. Both can bring really good things. 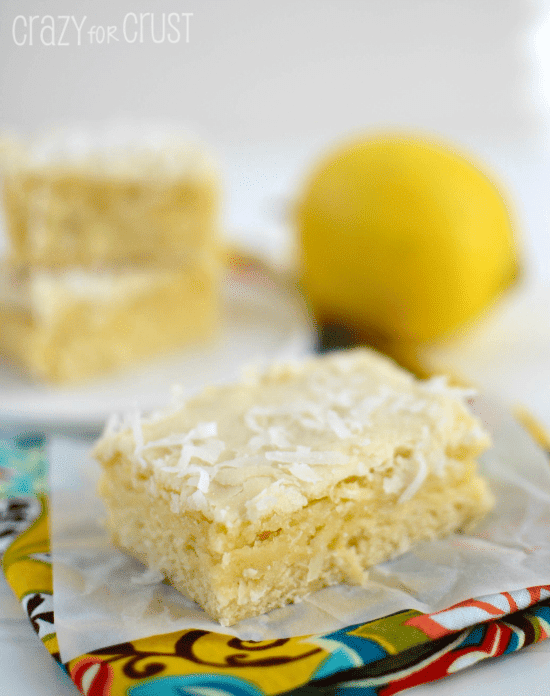 Lemon flavored blondies filled with coconut!! Preheat oven to 350 degrees. Line a 9x13 pan with foil and spray with cooking spray. Cream sugar and butter in the bowl of an electric mixer fitted with a paddle attachment. Add eggs and vanilla and beat until combined. Mix in lemon juice and zest. Add baking powder, salt, and flour and mix. Stir in coconut. Bake at 350 for 23-25 minutes. Do not over bake or they will be dry and cakey. It's best to remove them from the oven when they are still a little underdone so they can finish baking while they cool. Remove from oven and cool completely before frosting. To make the frosting: Melt butter and white chocolate together in microwave. Stir in powdered sugar and vanilla. Stir in cream to get desired consistency (I used 1 teaspoon). The mixtured seemed separated, but still worked! Spread a light coating evenly over the top of your bars and sprinkle with extra coconut. 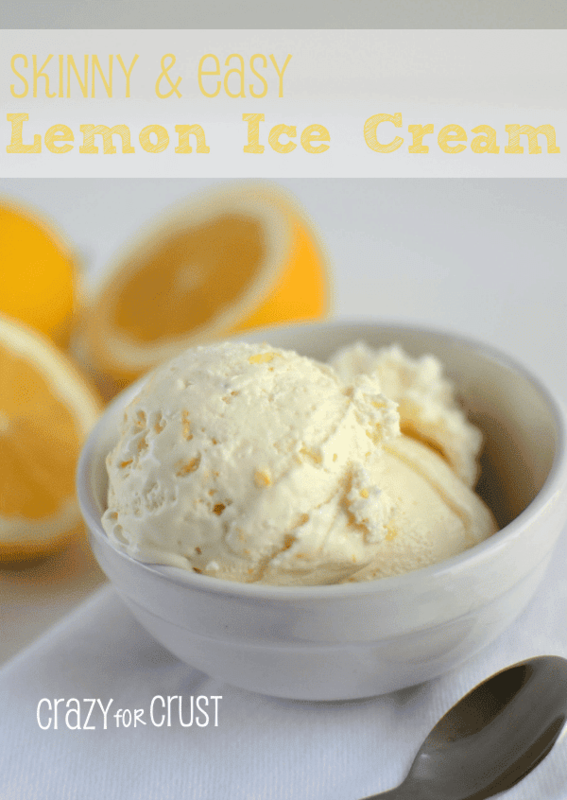 Click here to see the complete list of Lemon Recipes! Just made these for a picnic, and they taste soooooo good! Only problem is that mine turned out WAY thinner, like not even an inch in thickness. Maybe you originally baked yours in an 8×11 pan? They still taste great, but slightly overcooked. Next time I will definitely try making them in a smaller pan! Hmmm, not sure why that happened. My pan was a glass 9×13, same as I use for all the 9×13 recipes. I don’t think I have an 8×11 (but what a cool size, I want one!) Sorry they were thin! OMG these were so good! They melt right in your mouth; and are so addictive. Best blondies ever. So glad you enjoyed them! !